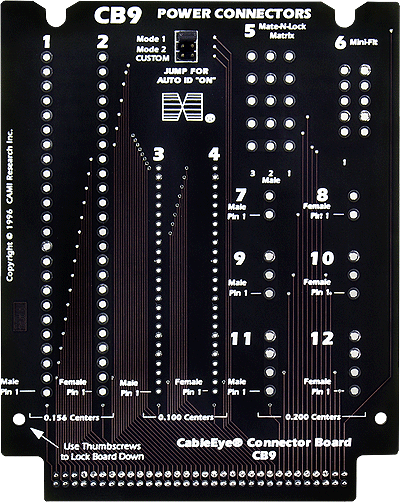 Each board includes connector positions for Molex strip headers and sockets (both 0.156" and 0.100" centers) up to 25 pins, AMP Mate-n-Lock connectors (2-, 3-, and 4-pin male and female), AMP Mate-n-Lock Matrix connectors (male, up to 15-pin), and Molex Mini-Fit (male, up to 10-pin). 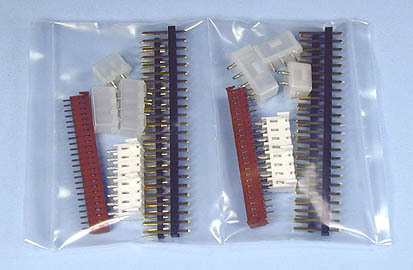 Because power connectors come in many different arrangements, we provide a standard set of connectors in a separate package (see photo of connector kit at bottom), unsoldered, so Users may configure the board as best suits their needs. For each board, the unmounted connector package includes Molex 24-pin breakaway header strip (0.156" centers), Molex 25-pin breakaway header strip (0.100" centers), Molex 13-pin header socket (0.156" centers), Molex 25-pin header socket (0.100" centers), and Mate-n-Lock male 2-, 3-, and 4-pin headers (for female cables). No matrix connectors are included. Software for connector graphics self-adjusts to measured wiring. Set of two boards.